I was travelling a bit last week (read my earlier post) and wanted to share a quick little tip I discovered. I've been to a lot of hotels over the years and it's rare to have the perfect combination of a mirror and a table/dresser to put your makeup on. For me, I've never come across a room that has this perfect combination. Either there is only one mirror in the bathroom (which is pre-occupied with my husband when I need to do my makeup) or there's a mirror on the wall but no table/dresser. Well I've solved this problem! 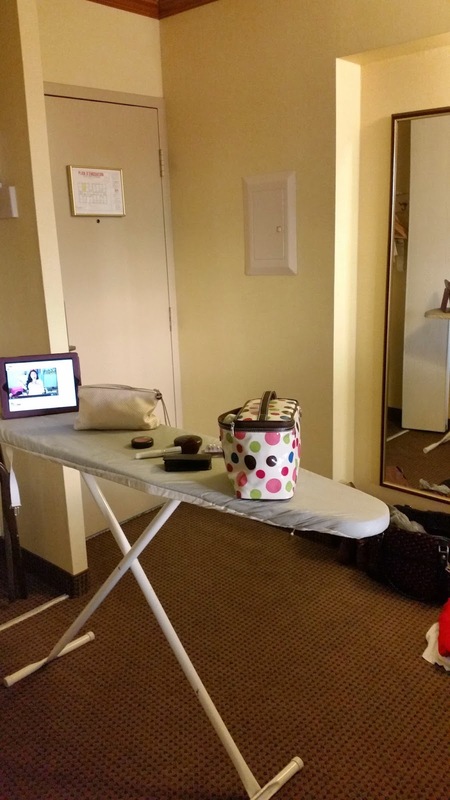 Use the ironing board as a makeup table! I don't know how this genius idea came to me but it works so well! In the picture above you can see that I placed the ironing board in front of the mirror. It was prefect to rest my makeup and watch my morning vlogs while I got ready! It's pretty awesome! What's your favourite hotel room hack? Express, Old Navy & Ardene's Haul! Pumpkin Patch, Corn Maze and Other Fall Fun! Happy Gobble Gobble (Thanksgiving) Weekend!